A few weeks ago, we witnessed one of the most contentious U.S. Women’s Open ever, when a chair umpire unfairly admonished arguably the world’s greatest athlete, Serena Williams, for what he saw as her attempt to cheat. She scoffed in her reply saying, “I don’t cheat. I’d rather lose than cheat.” If only our current political environment had the same gumption and clarity of conviction as Serena. When it comes to politics cheating is the new path forward for Republicans. And sadly, the people who are supposed to provide the checks and balances on these actions (such as judges) have become just as shady and politically motivated as the people working tirelessly to suppress the vote. In politics, much like in sports, it is the best candidate who is supposed to win. The one who puts in the most effort, knocks on the most doors and convinces the most people that they have the policies, drive and vision to reshape the lives of their constituents for the better. Usually the best candidate wins, but what happens when one person has an unfair advantage and changes the rules of the game to benefit their agency? There is no better case study for this example of the new Jim Crow than the hotly contested governor’s race in Georgia between Republican Secretary of State Brian Kemp and his Democratic competitor Stacey Abrams, who could potentially be the first Black woman governor in the country. In the Jim Crow South there were countless underhanded tactics used to stop Black people from voting. These schemes ranged from domestic terrorism instituted by the Klu Klux Klan’s bombings, lynching, and other vicious assaults to literacy tests and marble counting at polling stations. When Jim Crow was outlawed following unwavering protests during the Civil Rights era, many believed that voting would forever be protected under the Voting Rights Act of 1965 and it was until 2013. That’s when one of the worst Supreme Court decisions in modern times occurred in a 5 to 4 vote. SCOTUS gutted the very provisions of the Voting Rights Act that required mostly southern states to seek federal approval before changing their election laws. According to the Brennan Center for Justice, since this decision there has been a rapid increase in voter purging. In Georgia, for example, 156 of the state’s 159 counties reported an increase in removal rates after the Voting Rights Act was changed. In 2016, advocates sued Georgia for making it harder for residents to register to vote and in 2017, the American Civil Liberties Union sued a Georgia county and the state Secretary of State for its purge practices. It’s no surprise then that Georgia’s Secretary of State Kemp, much like the white supremacists before him, has dusted off the good old KKK voter suppression playbook and is pulling out all the stops to ensure he wins on election day. 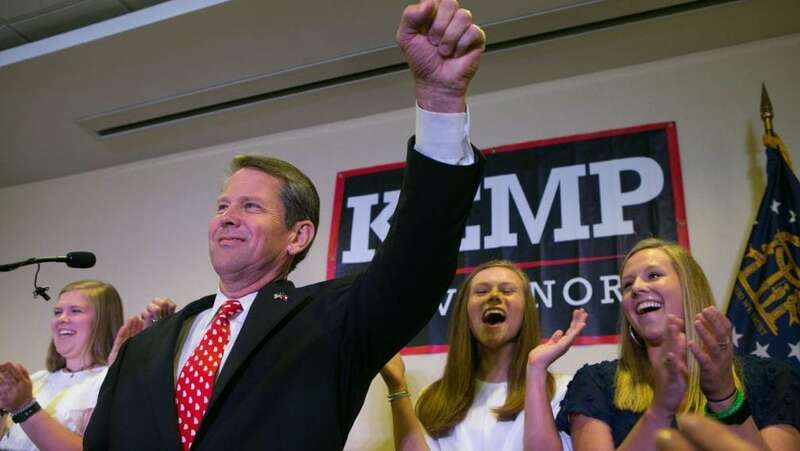 As one of the state’s top election officials, Brian Kemp should have recused himself from having anything to do with the voting process while campaigning to be governor. Instead, he has continued his seemingly prejudiced path of destruction by stripping the rights of more than 1 million voters in Georgia since 2012. You can’t ignore the glaring issue of race when these tactics have mostly affected Black residents. How in the world can Kemp be a player in the game and also hold the title of top judge at the same time? Better yet, how is Abrams supposed to win playing by the rules when her opponent is clearly not? The answer is she’s not. What we know to be true is that Republicans don’t win the popular race for a reason. Their ideas are not popular. Instead of working to be the G.O.A.T like Serena, they are too busy conspiring ways to change the rules of the game. Serena said, “I’d rather lose than cheat,” but when it comes to the dirty game of politics, there is more than a trophy at stake. We need to play like Black lives depend on this win because they do. Danielle Moodie-Mills is the host of the weekly political talk show #WokeAF on SiriusXM. She is also a regular commentator on MSNBC as well as a media maven and communications expert. Follow her musings @DeeTwoCents.